David Zeiler writes: Pay no attention to the new market highs or the cheerleading of government officials - recession 2013 is already here. That's what Lakshman Achuthan, co-founder and chief operations officer for the Economic Cycle Research Institute (ECRI), is saying now. Achuthan told the Daily Ticker that ECRI believes the U.S. economy has been mired in a "mild recession" since the middle of last year. And yes, he insists that recession 2013 is already underway despite record highs for the stock market and an obvious lack of the most widely accepted definition of a recession - two consecutive quarters of negative gross domestic product (GDP). "What we see here ... are the hallmarks of a recession," Achuthan wrote in a report on the ECRI Web site. "Separately, we are not seeing signs of an imminent growth upturn that so many claim to see." He remains undaunted that the rest of the financial community still does not see a recession he first predicted in September 2011 (and later moved from early 2012 to mid-2012). The reason ECRI sees a continuing recession where others see recovery is that it uses the more sophisticated definition of the National Bureau of Economic Research (NBER), a highly respected private, nonpartisan research organization. NBER uses a range of economic indicators in addition to GDP, and defines a recession as "a significant decline in economic activity spread across the economy, lasting more than a few months, normally visible in real GDP, real income, employment, industrial production, and wholesale-retail sales." Achuthan said in the Daily Ticker interview that the traditional definition of a recession often lags far behind the reality. "The average lag you've seen is that it's taken - before you've seen a real-time negative GDP print after a recession began - is two quarters," Achuthan said. In making his case that recession 2013 is already here, Achuthan noted that year-over-year nominal U.S. GDP growth is down to 3.5%. Historically, he said, whenever this number falls below 3.7%, the country is in a recession. Even stronger evidence comes from the U.S. Federal Reserve's Gross Domestic Income data, which measures all income within the economy, including wages, profits and taxes. According to a Federal Reserve study two years ago, a GDI reading below 2% indicates the economy is at "stall speed." 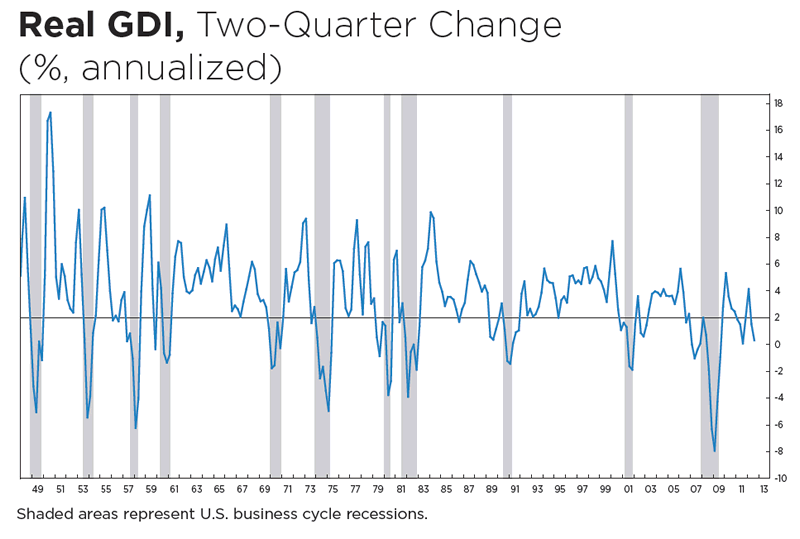 A chart of the GDI shows that such dips almost perfectly mirror recessionary periods. GDI fell in the second quarter of 2012 to 1.5%, below the critical 2% threshold, and fell to 0.4% in the third quarter. "So that is the evidence from GDP and GDI, and you can begin to draw your own conclusions about the U.S. economy and if it is in recession," Achuthan said in his report. He also told Bloomberg News that the only strength he sees is in market indicators. That helps explain why stocks are soaring even in a recession. "All the growth rates are coming down in our broad indicators," Achuthan told Bloomberg. Although unusual, it's not impossible for stocks to rise during a recession, he added, noting that stocks also rose during three other past recessions - in 1980, in 1945 and in 1926-27. He attributes much of the rise in stock prices, and to some extent the decline in unemployment last year, to the Federal Reserve's easy money policies of near-zero interest rates and quantitative easing. Whether or not we get a traditionally defined recession in 2013, what ECRI's report shows is that the economy has slowed in several key areas, and that poses a risk to stocks that are already reaching lofty territory. Money Morning's experts have some ideas on how investors can weather recession 2013, or even just a bumpy market struggling with slowing growth. "You want to shift at times like this to what the world needs," Money Morning Chief Investment Strategist Keith Fitz-Gerald said. "Energy is something that the world needs - never mind what's happening here in the U.S. or all the failed "green' stuff. I think you need medical tech. I think you need certain kinds of tech - the cloud, cyber-defense. Those are all things that have been in the headlines recently. Investors would be wise to look at that as opposed to what somebody wants." ■Gold and Silver: A good place to start is buying inflation hedges gold and silver. "Gold and gold-based investments such as gold mining companies are an important part of a permanent-wealth investment strategy because of gold's historic function as a store of value that is impervious to inflation," Hutchinson said. ■Dividend Stocks: In addition to providing income stability, dividend-paying stocks also hold the added bonus of capital appreciation. "In reality, as an investor, a dividend strategy is the first thing you should be considering," Hutchinson said.